CCA Faculty: Nominate your choice of a candidate here! To nominate a colleague for the Crossan Hays Curry award, describe why your candidate should receive the award, including specific examples of excellent teaching. 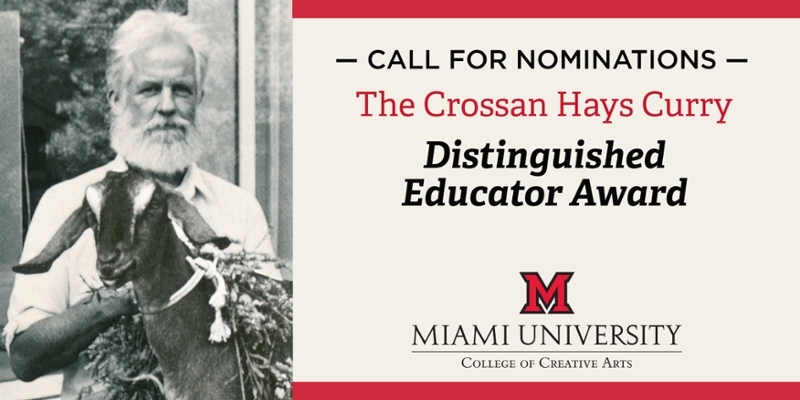 Please note: both nominators and nominees are required to be full-time tenured, tenure-track or LCPL faculty within the College of Creative Arts at Miami University. Recipients of the award will not be eligible for a second Curry Award. Nominees will be asked to submit supporting materials to the Committee. Complete the Curry Award nomination form. In 1994, the College of Creative Arts received a substantial endowment to establish an annual award to recognize a distinguished educator in the division. The endowment is named for Professor Emeritus Crossan Hays Curry, a former faculty member in the Department of Art, who was greatly admired by students for his teaching and his art making. The award recipient will be given approximately $2,000 in a professional expense account. Previous recipients include Rod Northcutt (2018), Gary A. Speck (2017), Pepper Stetler (2016), Murali Paranandi (2015), Harvey Thurmer (2013), Tom Effler (2012), Robert Benson (2011), Julia Guichard (2010), Sara Butler (2009), Chris Tanner (2008), Sandra Seefeld (2007), John Reynolds (2006), Brenda Mitchell (2005), Jim Killy (2004), Mary Harris (2003), Michele Gingras (2002), Steven Shumway (2001), Peg Faimon (2000), John Weigand (1999), Clive Getty (1998), William Albin (1997), Tom Dutton (1996), and Crossan Hays Curry (1995). We invite you to submit nominations for the 20th recipient of the Curry Distinguished Educator Award. Nominees will be asked to submit supporting materials to the Committee. Nominations for the Annual Crossan Hays Curry Award close on the first Monday in April. Nominees will be announced at the final College of Creative Arts Faculty and Staff meeting of Spring 2019, with the award presentation at the Divisional Recognition Ceremony.